Tom picked up the guitar when he was 12 and never put it down. In addition to his roots in classic rock, he has studied classical guitar and jazz, and is influenced by funk and latin. He has toured all over the world and performed alongside artists like Joan Baez, Norton Buffalo, Randy Vincent, Mel Graves, Steve Smith, and Kai Eckhardt. Tom's formal training includes over ten years of study in music theory, performance, and education at Mills College, Sonoma State University, and College of Marin. He has taught music for over two decades and is our go-to guy when it's time to shoot classic rock songs. Tom will show you all the parts to this song from the blistering solo, to the call and response between the guitars and vocals. The tune begins and ends with a Latin/Cuban feel and breaks into a swing feel and a major key in the middle. Tom will show you all the guitar parts in this epic rocker: chorus, verse 1, the bridge, verse 2, the solo, solo accompaniment and the outro. The song is in the key of G minor and is 4/4 time with a quarter note of 120 BPM for the normal sections & 178 BPM for the uptempo sections. In this set of lessons, Tom Finch will teach "Bad Reputation", by Thin Lizzy. Tom will start by introducing the song and the gear and tones, then get into the verse riff. The progressive chorus is next with its 5/4 bar, then the rhythm during the drum solo. After that you'll learn the bridge melody and the solo rhythm before we look at the solo in 2 parts. Full and single guitar play alongs are next, then we end with a jam along. In this set of songs lessons, Tom Finch will teach you "Black Water", by The Doobie Brothers. Tom will introduce the song and talk about the gear and tones, then talk about the tuning and break down the intro and verse part. Next is the chorus section, followed by the post-chorus; then you'll learn the sweet solo. We'll end with a play along performance, then you'll take over in the jam along. In these eight song lessons, Tom Finch will break down all the elements in the classic rocker "Born To Be Wild", as made famous by Steppenwolf. Tom will examine the gear and tone, then get into the instantly recognizable opening riff. Then we're on to the verse, chorus, and pre-chorus parts, and the rhythm behind the organ solo. Tom will then show you the psychedelic soloing; we'll end the trip with a full performance play-along and a jam along. Tom will show you both beautiful guitar parts to this instrumental, from the smooth chord comping to the melodic soloing. In this song tutorial we take a look at Crimson and Clover, as made famous by Joan Jett in the 80s cover version. We all know that Joan Jett seriously rocks, and these lessons cover the guitar tone, how to approach the verses and choruses, the 2 against 3 rhythmic accents, the punky solo, and the multi-guitar outro. Tom will show you all the great moves in this iconic acoustic, bluegrass tune by a legend in the genre. He covers the swingy blues rhythm and licks along with a fast double-time feel and some very fancy Travis-style finger picking. In this song tutorial, we'll take a look at the classic 70s tune, "Do It Again" by Steely Dan. This song was a huge radio hit! We'll talk about the gear and tone, and learn the verse and chorus comping pattern plus some tasty octave and jazz lines for the intro. Then we'll tackle the electric sitar solo - which is no small feat - but don't worry, the electric sitar is tuned just like a standard guitar, so you don't need a specialty instrument to play it. We'll learn a few more lines and improvise for the fade out. At the end we'll put it all together and play along with the backing track! Tom will show you all the parts to this iconic bluegrass standard: the banjo intro, the rhythm guitar, the slide solo, and the outro. Tom Finch will show you the funky, rock and blues cover of a classic R&B tune!The rhythm guitar plays a driving and funky groove while the rhythm section lays it down. There is very little harmonic movement but plenty of soul! This classic rock song features power chords, edgy guitar fills and single string unison with the bass. In this tutorial we'll talk about gear and tone, we'll learn the intro, the verse, chorus and the outro. In this tutorial Tom will show you the guitar parts to this iconic blues tune. You’ll learn the tasty call and response guitar parts for the intro, verse 1, verse 2, & verse 3. The song is in the key of A-flat and is in 12/8 with a quarter note of 75BPM. Let's get started! "I Just Want to Celebrate" was made famous by Rare Earth in 1971. We'll learn the signature guitar hook which is also the chorus, the verse riff and power chords, we'll learn the B chorus, a short solo, and four rocking guitar fills. At the end we'll get pyschedelic with some feed back and delay loops before we do our play-along. Tom will show you the killer riffs and solo to this classic rock cover of a blues tune. There are lots of call and response lines, lots of tight riffing and some great sounding harmonized lines. In this tutorial we'll visit the live classic made famous by Cheap Trick in 1979, "I Want You To Want Me". Tom Finch will talk a bit about the gear and tone, then teach you the intro, the hook, the verses, pre-chorus, and chorus; the two solos; and the outro. Then we'll play it along with the full backing track. Tom will show you both guitars in this iconic blues tune, including the verses and the solo. In this series of lessons, Tom Finch will teach you "Knock on Wood", by Eddie Floyd. Tom will talk about what you'll be learning, then look at the gear and tone. The first playing lesson is on the intro and chorus parts; following that we'll dig into the verse and pre-chorus. Next up is the bridge, then the outro. We conclude with a performance play along, then you play the song by yourself in the jam along. 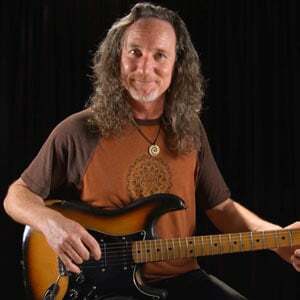 In this eight lesson tutorial, Tom Finch will teach you the classic rocker "Listen to the Music", as made famous by The Doobie Brothers. Tom will go over the gear and tone, then dive right into the infectious opening riff that's such a powerful hook. Tom will then break down all the details for the verse, the chorus, and the soft floating bridge. He'll end with showing you the lead fills that occur in the outro, and then do a full play-along performance. In this song tutorial we're going to learn to play the classic rock hit "Long Train Runnin'" as made famous by the Doobie Brothers in 1973. Written by Tom Johnston, this tune features one of the most signature rhythm guitar parts of its time. This is a great example of a high energy funk-rock song propelled by stereo electric guitars and spiced up with cool and colorful acoustic guitar counterpoints. We'll check out the gear & tone, we'll learn the signature rhythm guitar part, the acoustic guitar counter parts, the 12 bar chord progression, some rhythmic variations, and the four guitar outro. Finally we'll put it all together and jam with the backing track! In this set of lessons, Tom Finch will join you on a psychedelic journey and show you how to play "Magic Carpet Ride", as made famous by Steppenwolf. Tom will get into the gear and tone, then show you how to play the intro noises; then he'll break down the classic rhythm riff in the verses and choruses. Next up is the moody post-chorus section, which leads us into the jam section and the call-and-response leads. We'll end our magic carpet ride with a play-along. In this tutorial, Tom Finch will teach "Mockingbird", as made famous by James Taylor and Carly Simon. Tom will start with an introduction and a look at the gear and tones, then detail all the parts for guitar 1: the intro, verses 1 and 2, the solo rhythm, the key change, then verses 3 and 4 and the outro. After that Tom will do the same for all the sections for guitar 2, then we'll conclude with play alongs and a "guitar karaoke" jam along. Tom will show you the guitar part verses, the choruses, the solo and the outro. The song is in the key of E and is 4/4 time with a quarter note of approximately 100 BPM. In this song tutorial, Tom Finch will detail all the elements in "Reelin' In The Years", as made famous by Steely Dan. We'll talk about gear and getting the right tones, we'll learn three (yes, three) guitar solos, a slew of tasty guitar fills, the rhythm guitar parts, as well as the melodic hook and harmony line. After all that, we'll wrap it up and rock with the backing track, featuring Tom's vocals. Tom will show you the 2 guitar parts in this blues tune. He covers all the sections: the intro riffing, the verses, the choruses, the bridge and the outro. And, of course, he covers the iconic bluesy solo licks of the two blues masters! Tom will show you all the parts to this great blues tune from the understated rhythm guitar parts of the verses and choruses to the soulful solos. In this set of song lessons, Tom Finch will teach you the song "Rock and Roll Hoochie Koo", as made famous by Rick Derringer. Tom will talk about the gear and tones, then start in on the famous intro riff. He'll break down the verse and choruse section, the rhythm part that's played under the solo, the rippin' solo, then the outro to the song. As always, there's a playalong performance of the whole song at the end. Tome will show you all the parts to this great study in solo-blues playing where the thumb keeps a quarter note pulse while the higher strings play fills & riffs around the vocals. Tom will show you all the tasty licks and fills that BB King plays in this slow burn blues tune. In the lessons in this song tutorial, Tom Finch will be teaching you "Sister Golden Hair", by America. Tom will first look at the gear and tones, then he'll launch into the intro of the song. Then it's straight through the rest of the form, examining the role of each guitar in the verse, the chorus, and outro. Tom will lead you through a play along, then you take over and jam by yourself with the backing track. In this set of lessons, Tom Finch will be teaching you the song "Slow Ride", by Foghat. Tom will give you an overview of the tune and talk about the gear and tones, then dig right into the classic main riff. Next up is the chorus, followed by a look at the verse and pre-chorus sections. The last three lessons will break down the post-chorus, the melody, and the outro, then we'll finish with a play along. Tom will show you both guitar parts in this old school, down & dirty grinding blues with a mixture of slide & basic blues riffs played by one of the iconic masters. Tom will show you all the great acoustic blues parts in this song: the intro, verse 1, verse 2, verse 3 and the outro. Tom will show you all the parts to this great solo acoustic blues song: the intro, verse 1, variations on measures 11 & 12 and the ending. Tom will show you all the intricate details of this classic cover of an iconic Gershwin tune. There are plenty of guitar parts to keep busy from clean to distorted, from delicate and pretty to loud and screaming. Tom will show you all the parts to this classic blues tune: the intro, the melody, the sax solo comping and the verse comping. Tom will show you the simple, but steady and powerful strumming rhythm that drives this pop classic with a hand full of chords. Tom will show you all parts to this folk guitar classic. It’s all one solo acoustic guitar with multiple sections: the intro, part 1, part 2, part 3, part 4, part 5, part 6 and the ending. The song is in the key of E and G and is cut time with a quarter note of approximately 100 BPM, making it effectively 200 BPM. Tom will show you the great blues guitar parts in this classic song: the intro, the verses, the harp solo accompaniment, and the ending. In this set of 12 lessons, Tom Finch will teach "Wild One", by Thin Lizzy. Tom will start with a song introduction then talk about gear and tone before he lays out the intro/chorus rhythm and leads. The verse parts are up next, then we'll look at the solo rhythm and the main solo. The outro rhythm follows, then the outro leads; then we'll do full and single guitar performances and end with a jam along.